A fashion designer said the worst fashion mistake he sees all the time is "a bad haircut". Said people should spend as much as they can to have their hair look good. So my thought on the worst fashion mistake an association exec can make is a bad handshake. I honestly cannot stand it and remember that detail about someone. Unless there is truly a medical reason for it (and there can be), how in the world can someone not learn to give a firm handshake? There's an interesting controversy noted in Editor & Publisher about a newspaper publishing the names and addresses of those who didn't vote in the 2004 election. Trying to "shame them" into voting. Associations now have more information than ever about members who "don't" do something. For example, legislative software doesn't just show who made calls to action, but also makes it clear who didn't. Membership records show who completed a required course, but also makes it easy to create the list of those who didn't. An association had thousands who had met a requirement, and several hundred who had not. For months multiple reminders including personal email notices and postcards were sent. Later, the list was published (online) of those who had done it; then, the list of those "missing" (not yet completing) the requirement was published. Guess which one got more attention? Maybe it's just human nature but it's often far more interesting to click to see who's on the "didn't do" list than the ones who did it. And thus, far more effective in getting results. If there is shame in being on a list of those "who didn't", should that step not be taken? ... "a year of living with Satan"
So, what did my headline make you think ... an evil member, a bad staff person, a possessed piece of office equipment, trouble at home? It's actually a description that the writer for the blog Dooce wrote about her year old dog, Coco. 1. You CAN read more than business related books and blogs, if you don't already know that. 2. She was fired for writing about her job and co-workers on a blog - the definition of "dooced". 3. Removed first months of postings from blog archives because she hadn't yet "learned boundaries". 4. Has daily dog pictures. Use a dog picture, tell a dog story - it gets attention from the other "dog people". So if you're an association exec who can manage many things, but yet still have an entirely misbehaving pet - check out the video of Coco. My friend Judith Lindenau's blog has a big list of practical tips on how to cut expenses, manage cash flow and raise revenue at associations. 1. Examine switching to home working for staff to minimize property requirements and travel-related expenses such as employee parking. 2. Consider the extent to which you can operate a hot desking program. 3. Negotiate with your communications carrier ensuring that each category (voice, mobile and data) is optimized for your consumption levels as you reconfigure your office. Consider using an internet telephone carrier. 4. Review communications consumption with each person who uses company cell phones. 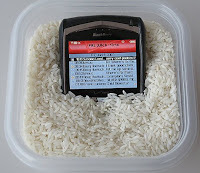 In many cases cell phone expense can be minimized, or eliminated altogether. 5. Switch to low energy lighting. There’s some cost to acquiring the bulbs, but the long term savings usually outweighs the cost. 6. Request an energy audit from your energy service provider. 7. As much as possible, eliminate printed material and associated postage. You won’t get rid of it all, but you can almost certainly make material savings. Again, charge extra for paper delivery: it COSTS extra, after all. 8. Review the potential to use online storage services such as Box.net. If you’re a small association, this is an ideal way to make electronic files available from anywhere to anyone with a password. 9. If you buy a new printer, purchase a laser printer. If you have an inkjet printer, lower cartridge costs by using a refillable service. Click this link to get entire blog article and tips. While a guest on the Oprah show, Gloria Steinem said the difference between depression and sadness is "with depression, nothing matters; and in sadness and grief, everything matters." Billie Jean King was on the same show, lauded for all she did for women's sports/Title IX and the impact of the infamous Battle of the Sexes tennis match (35 years ago!) She compared tennis as a metaphor for life saying, "Every time a ball comes to me in tennis … I have to make a decision and I have to live with the consequence." When I was really young, watching both of them, Gloria and Billie Jean seemed like they were my mother's age. Now they seem like peers. Amazing how that happens. The flight I didn't take tonight is already 3 hours late (I'm watching it online). Travel is such a pain. Do you check to see what would have happened to your scheduled flights you end up not taking? 1. On a cruise, take a cab to a rental car agency, not the free bus. You'll be first in line. 2. Buy a padded seat-belt cover from auto-parts store to use with travel bag or camera straps. 3. Line the inside of your suitcase with bubble wrap and layer between clothes. Reduce wrinkles and you'll use with souveniers later. 4. If you lose a screw on glasses, and out of town, use the sewing kit to stitch together until get home. 5. Create a "photo album" on your cell phone of pictures of basic things you may need when travel to foreign countries. Point to picture if don't know the foreign words. 6. If your flight makes you miss the start of a cruise, ask if you can take another ship leaving next day instead of flying out to your own boat at its next stop. 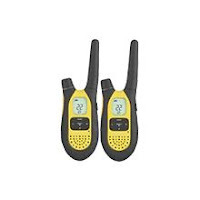 When my teenage daughter and her friend went to Europe this summer I had them carry the walkie-talkies we use when skiing. Never know when they'd get separated and couldn't easily use their cell phones to reach each other (range is several miles). Who says gift cards are impersonal? A few years ago I waited WEEKS for an Am Ex gift card to include someone's name on it. Now many cards (like Applebee's - pictured) and Macy's provide option to add photo of your choice and message onto gift card. Could have company logo, building, pictures from an event, etc. Or Starbucks allows to customize with drink favorites and name on gift card. Are you fighting destiny or living your destiny? "I had the first glimpse of my future when I was about eight years old. I saw an article about a cartoonist who was doing okay for himself, a guy named Charles Schulz. I remember looking at his picture and feeling that was my future job. The sensation was different from wanting or hoping. I wanted and hoped for lots of fantastic things, but I have only had one vision of my future career. And as I spent the next 20 or so years working on a more traditional career path, I never shook the feeling that I was supposed to be a cartoonist. It always felt like I was fighting destiny." So, are you fighting destiny, living your destiny .... or have absolutely no idea? Blog Action Day: "For I was Hungry"
Blog writers throughout the world (including me) have committed to spend one day per year all writing about a single topic of importance. This year's "Blog Action Day" focus is poverty. I've lived in my community for over 20 years; but it took our local newspaper writing a series entitled "For I was Hungry" to realize the magnitude of hunger throughout Maine, and the impact. Completely shook me. For example, one aspect of hunger is the huge percentages of kids who attend school hungry, which impacts their ability to grow and to learn. When we sit at our desks thinking about lunch, imagine not being able to have lunch. Poverty and hunger are real. Not just other parts of the world, but in our backyards, in our schools, in our communities. Help can come in many forms - from making donations to schools, contributing to food banks/drives, volunteering to raise money, or ensuring elected officials understand the cost of not providing food subsidies. Everyone can participate in some way to end poverty - and hunger. 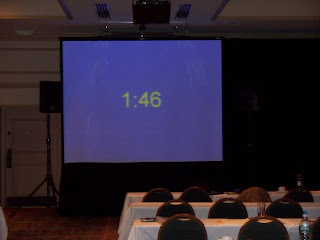 A speaker posted a countdown on the big screen showing when the mid-program break is over. It worked well. I looked wistfully at a stack of (non-business) magazines I've been meaning to read, and noticed some were dated as far back as August 2007. Two words: Email detox. There really is no reason to check email on a holiday when magazines are dating back 14 months. So I read a stack of magazines, took the dog on a 5-mile walk, and went to a movie ("Nights in Rodanthe") with a friend. There were 8 total in the theater, all women over the age of 40, BUT ... 5 were dressed like pirates. They were even talking like pirates (it's odd to hear "Richard Gere is handsome" in pirate-speak -- and they all started arrring after it). And I didn't even ask them what the deal was, or take their picture - because if I'm not even interested in my email today then surely I didn't really need to know the story. I strongly recommend trying email detox. You might need to put your computer in the car, and disable email on your Blackberry (as I did) - to avoid the temptation - but it's worth it to have a normal day doing normal things. A fundraiser at a convention included a 50/50 drawing - where winner keeps half the money raised. Instead of a flat fee for tickets, they were sold 4 tickets for $5 or an arm's length for $10. Really encouraged many purchases of the $10. A lot of money raised. 3. Have many ticket salespeople, not just a few. If they're just sitting at a desk selling tickets, it's not as effective as a lot of people walking to each table selling them too. But do need to sell at registration desk too. 6. Had 300 email messages that could have been read by anyone who found it (that appeared before I disabled it). Nothing exciting in there - BUT able to read them before activating my service. Another sign to watch what's in email. But the most interesting question I got today while bemoaning my missing phone: Did I check my bra? That may be a fundamental question that separates women with different bust sizes. I would absolutely never think to consider that a potential place to lose something; even though I worked at a movie theater in high school and recall customers routinely dig around in their bras for money. I have however asked people if they checked the cuffs of their pants for missing earrings, contact lenses or lapel pins. Any other thoughts? I had programmed my Blackberry to display my home phone number in case it was ever lost. Blackberry, phone home.